Too many people are dying or being seriously injured in crashes involving heavy vehicles. Heavy vehicles can be made safer for people walking and riding bikes, and you can help make this change. 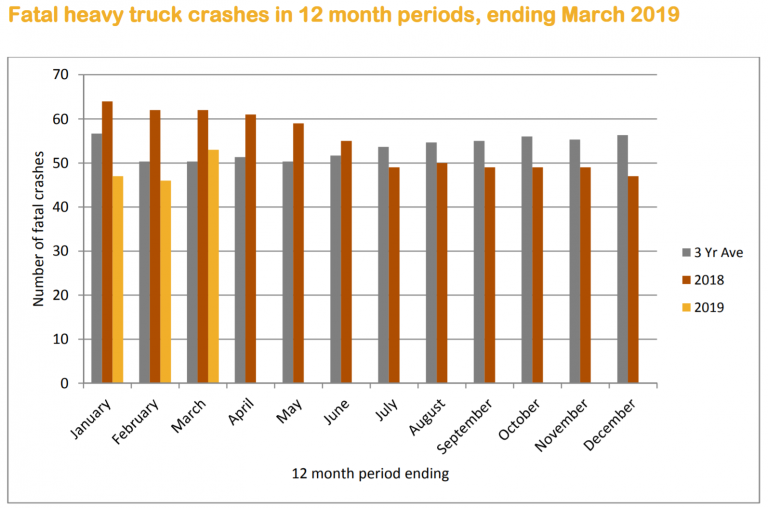 According to the Department of Infrastructure, Regional Development and Cities, 216 Australians died in 2017 from 196 fatal crashes involving heavy vehicles, up from 207 in 2016. According to NSW Road Safety there are an average of 53 fatalities and 1308 serious injuries from crashes involving heavy vehicles per year. Whilst there is an overall downwards trend in fatalities, fatality rates for people walking and riding bikes have risen according to Transport for NSW . Current road safety education focuses on vulnerable road users taking extra care around trucks, but more can be done to make heavy vehicles safer for everyone. Some models of heavy vehicle have high-visibility cabs, to enable drivers to see more of what is happening around them. Heavy vehicles can also be fitted with sensors that help drivers detect people in their blind spots, and side under-run protection that reduces the chance of a person being fed under the wheels of the truck if a collision occurs. Cities, like London, have set standards requiring Direct Vision Standards and Safety Permits for vehicles over 12 tonnes entering the city and schemes like the Construction Logistics and Community Safety Scheme help protect vulnerable road users. “We know heavy vehicle drivers do not want to kill people and we applaud the operators who have voluntarily fitted safety systems to their vehicles,” said Bicycle NSW General Manager of Public Affairs, Bastien Wallace. “We are calling on everyone to help make heavy vehicles safer,” said Bastien. the Federal Government to compel existing heavy vehicle operators to adopt safety systems, such as side under-run protection, blind-spot sensors, to protect people within 3 years and to assist small operators to meet the costs of compliance existing vehicles. the Federal government to set standards that compel operators to move to high visibility trucks – especially in urban areas. Over the coming weeks we will be sharing more content on heavy vehicles, to help make our roads safer for everyone.